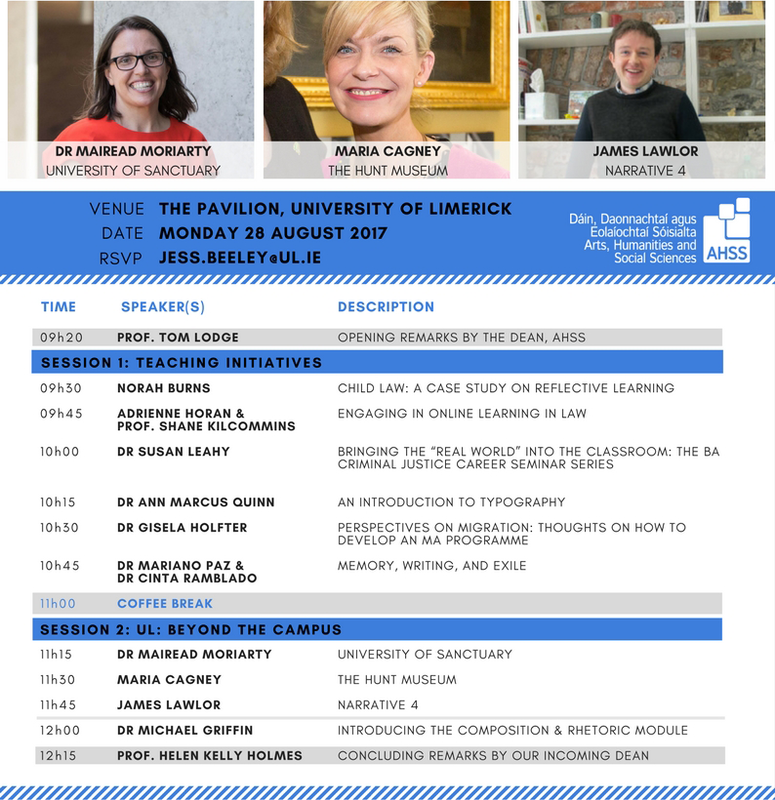 The Faculty of Arts, Humanities & Social Sciences Teaching Day will take place on Monday, August 28th 2017 at the Pavilion, University of Limerick. The first session will examine teaching initiatives which took place in the Faculty this year. Dr Mairead Moriarty: This year, UL was awarded the new status of University of Sanctuary. Mairead will talk about ways you can incorporate this into your teaching. Maria Cagney: As Curator of Education and Outreach at The Hunt Museum, Maria will discuss ways in which UL can work with the museum. James Lawlor: Regional Director of Narrative 4 Ireland, James will talk about how UL can work with Narrative 4, which is based on O’Connell Street, Limerick. Finally, our ADAA, Dr Michael Griffin will introduce the new Composition & Rhetoric module. All UL faculty are welcome. Please RSVP to jess.beeley@ul.ie by Thursday 24th August. Below is our full list of speakers. Download the full programme here.